The Rebel Sweetheart. : Enter the Global Giveaway | Win a Beauty Bag! 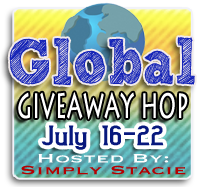 Welcome to the Global Giveaway Hop hosted by Simply Stacie! This event features all worldwide giveaway and runs from July 16th to 22nd. If you're an avid follower of my blog, then you know that international giveaways are nothing new to me. Most of my past giveaways were open internationally, which gave just about anybody the chance to join - and win. I have had the opportunity to work with some of the most generous brands and companies, to whom I will be forever grateful. This time, I decided to sponsor this giveaway myself. It's my way of expressing gratitude to my 7,400 Facebook fans, 3,500 Twitter followers, 750 GFC friends, and everybody else who takes the time to visit my blog. Use the Rafflecopter below to enter the giveaway. As always, you are not required to complete all of the tasks, but by doing so, you earn more entries and increase your chance of winning. The tasks are pretty simple - you wouldn't have a tough time finishing them all. Good luck! And do check out all the amazing prizes that my fellow bloggers are also giving away! Prizes have a minimum $15 value, and they're open worldwide, too! I'd love to see more cosmetics. Maybe polishes. I love all kind of nail polish, so I would love to see some as a prize! Nail Laquers or hair products, serums etc. I would love to see a cosmetics giveaway! for my wife! Thanks in advance! I hope to win... finger crossed!!! I want to see perfume or cologne on your next giveaway. Thanks! sleek palettes giveaways! :) thanks! as much as i love love love cosmetics and perfume i would love to see something different like the wigs and stuff thats an awesome giveaway! i have never seen that as a prize before. Maybe some cool contact lenses or something! that would be awesome! I would love to see a perfume giveaway! Im hoping for a new cp...ung hindi naman po mahal...but, kahit ano po ok lang! I love also beauty products, lalo na pag may reviews! I love this giveaways... beauty products because i can use it in my special occasion. Shoes and T-shirt i want this giveaways next time.. I love make-up so I'd bet on the eye shadow palettes, hihi! I love nail polish - Thanks! Amazing!!! I love this giveaway! The prize for the next giveaway? Sephora Palette!